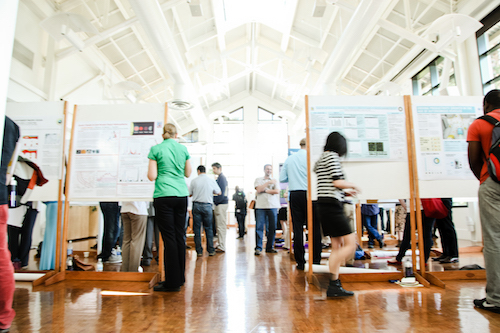 Annual graduate and undergraduate research symposiums at UCSC allow students to share their work through posters, live presentations and media demonstrations. The Koret grant provides scholarships for undergraduate students from any discipline who work with a graduate student mentor. Student Success. Those two words represent an effort at UC Santa Cruz to improve graduation rates and decrease the time to earn degrees, regardless of high school, family income, race, or ethnicity. First, “Five for 2015” goals were set in 2011, which led to the establishment of a Student Success Steering Committee and later the Division of Student Success, the draft of a strategic plan to increase graduation rates by 10 percent, and the Student Success Evaluation & Research Center (SSERC). Then came recognition from the Koret Foundation, a San Francisco-based organization that supports civic, cultural, and educational organizations that promote a vibrant and distinctive Bay Area. The foundation has selected UC Santa Cruz as one of 12 Koret University Partners and provided a $1 million grant for the new Koret Undergraduate Research Scholarships. Applications for the $1,500 undergraduate research scholarships are now open until Nov. 30. Fifty scholarships will be awarded to students in any discipline, and the grant will also provide limited funds for supplies, travel expenses, and stipends to faculty members and graduate students, who will mentor each project. The Koret Initiative proposal was authored by Padgett, along with Samara Foster, managing director of the SSERC; Nathaniel Deutsch, director of Jewish Studies and director of the Institute for Humanities Research; Richard Hughey, vice provost and dean of Undergraduate Education; and Tyrus Miller, vice provost and dean of Graduate Studies. Double the size of the College Scholars Program to 400 students at 10 colleges, reaching 10 percent of the freshman-sophomore population, in an effort to prepare motivated students for research. Showcase the research during Student Achievement Week each spring with the Koret Research Slam. Carry out research within the SSERC to evaluate the effect of the student success programs on student retention rates. The grant will fund one graduate student researcher and two undergraduate research assistants under the leadership of SSERC Faculty Director Rebecca London and Managing Director Samara Foster. For more information on the Koret Undergraduate Research Scholarships email Samara Foster or visit the Undergraduate Research Opportunities website.